To improve health care in the future, we provide rigorous training for residents and medical students. Cardiothoracic Surgery Residents become skilled in the full range of cardiac, thoracic and esophageal repairs, with graduated responsibility for the care of patients. 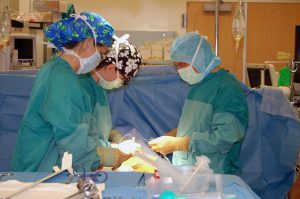 6-Year Cardiothoracic Surgery Residency – In 2010, UNC began a new, integrated 6-year residency in Cardiothoracic Surgery; residents enter the program directly from medical school. General Surgery Residents – UNC General Surgery residents rotate on both the thoracic (post-graduate year 1) and cardiac (post-graduate year 2) surgery services. Medical Students – Medical students are usually on our service for a two-week period during their third year. They participate in all functions of the service. Some students do a sub-internship during their fourth year. With the Department of Physiology, we offer the Physio-heart surgery selective (PHSSL) for first-year students, and our faculty members frequently lecture to medical students.